Rajma has always been comfort food to me. It was the one thing I always requested my mother to make for lunch on every birthday! And it invariably made its way into our school lunch boxes at least once a week. Rajma also happens to be one of Ro’s favourite dishes. Probably that explains the fact as to why I revere these tiny shiny kidney shaped beans even more than before. And I definitely need to tell you why it’s taken me so much time to share one of my most special recipes with you. Each time I made it, I felt the need to perfect the recipe more than the last time I made it. After all, it was one of those recipes closest to my heart. 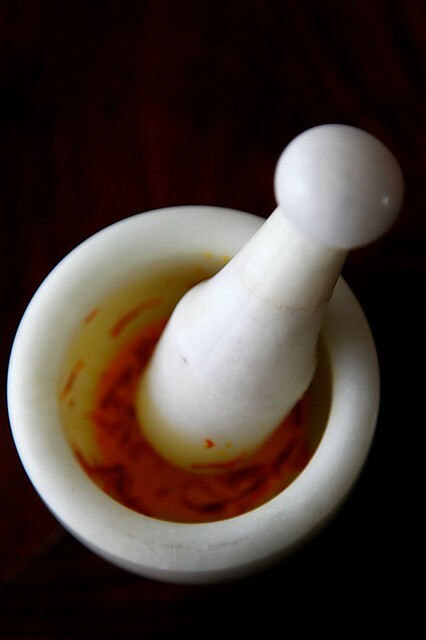 But, as I was grinding the spices in my mortar and pestle, something told me that the time had come! The time to share it with you! Although garam masala (store bought or homemade) works perfectly well here, I like to hand pound my spices to make rajma. This not only lends an exotic and earthy touch but is also something that I find extremely therapeutic. As the flavours released from the spices waft through the air when pounded this way, it is magical! Trust me and try it for yourself! This recipe uses a special spice combination with the aromatic and flavourful asafetida or hing. Onions and garlic are also conspicuous by their absence. As discussed before, in the book “Kashmiri Cooking”, Krishna Prasad Dar mentions that basic difference between the two primary schools of Kashmiri cooking Kashmiri “Pandit” and “Muslim” is that the Pandit’s used “hing (asafetida) and curd (yogurt)” and the Muslims used “onions and garlic”. You might be surprised to know that originally, onions and garlic were never used in Kashmiri cooking and its only now that it has been adapted into mainstream cooking as people have acquired a taste for them. 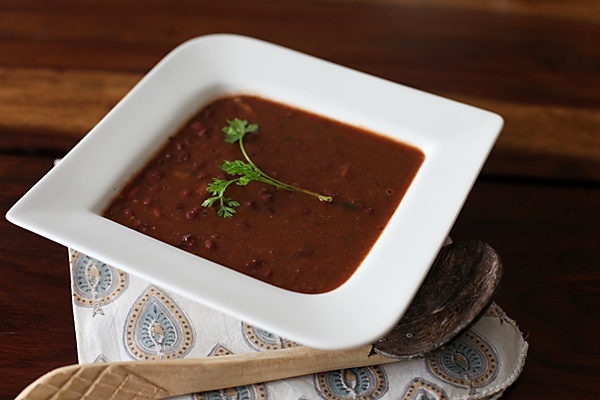 For those of you who have never made rajma before, this recipe will pleasantly surprise you and give you everything that you look for in an Indian curry with tangy, mildly spicy and comforting flavours. And for those of you who have been cooking rajma, this recipe will prove to be a nice variation and for all you know, you might not miss the onions and garlic at all! 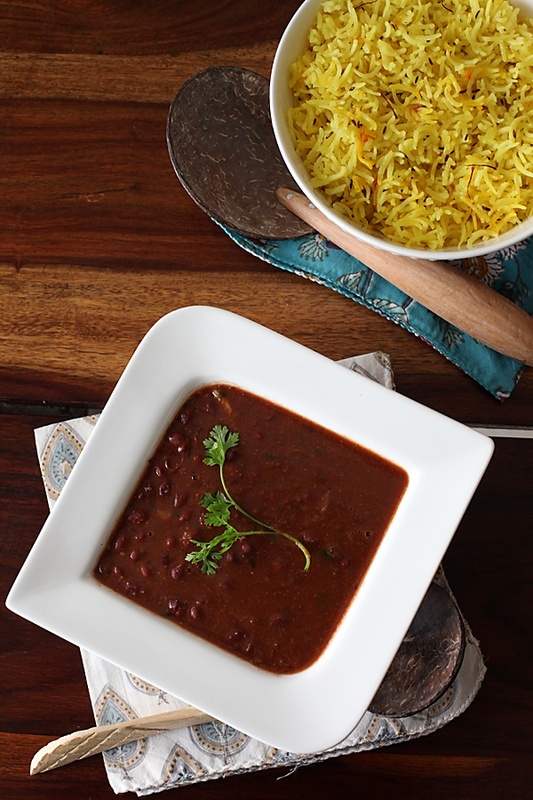 We relish rajma with plain rice, cumin rice and this exotic saffron rice. 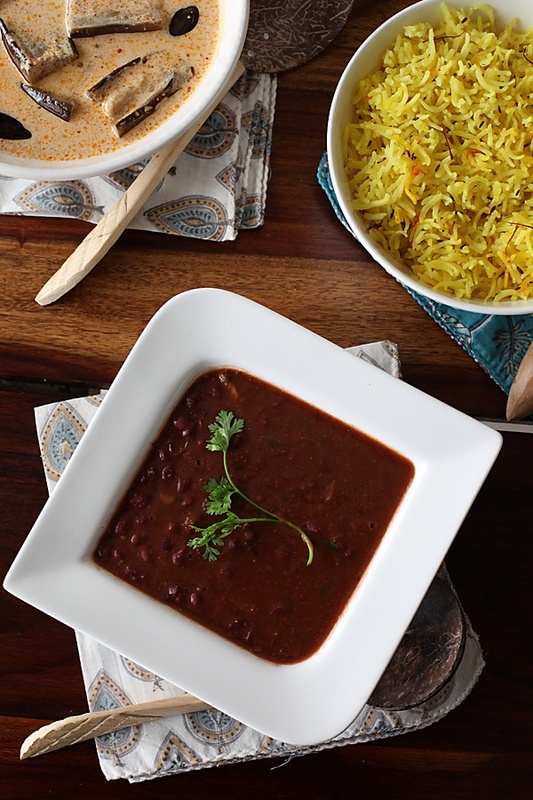 This combination of rajma and saffron rice is a great favourite in our household. The Kashmiri saffron lends such an exotic touch to the rice that it has to be experienced to be believed! Besides it is quite simple and quick to make and will pair well with other Indian curries. Add the eggplant in a yogurt gravy to this menu of Kashmiri rajma and saffron rice and you have a meal fit for a king! Simple yet exotic, wonderfully flavourful and delicious and so comforting that you would be reminiscing about it, long after you have relished it! It is also one of those menus I love to serve my guests for lunch and dinner. When this is on the cards, you only have to think what you have to serve for dessert! Try and select the smaller variety of rajma (kidney beans) for this recipe although you could substitute it with other varieties. 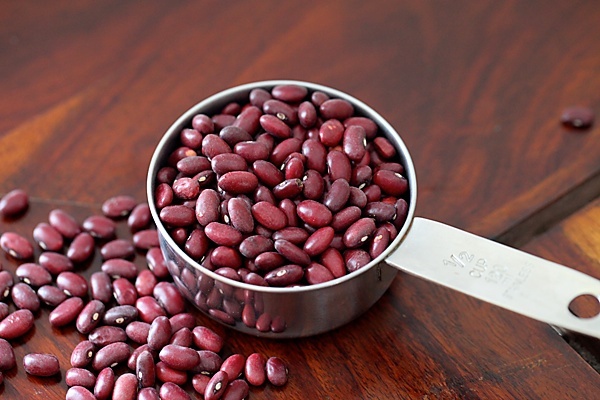 Wash and soak the rajma beans in water overnight or for 6 to 8 hours. Discard the soaking water and place the beans in a pressure cooker along with the bay leaf and 5 cups of water. Pressure cook until the first whistle and then lower the heat and cook for 10 to 15 minutes more until the beans are properly cooked and some of them split open. The cooking time depends on the quality of the beans. Once the beans are cooked, drain the water over a colander and reserve it. In a wok or kadai, heat the oil over a medium flame. Pop in the cumin seeds and when then change colour, lower the heat a little and add the asafetida and the ginger. Stir for a few seconds and then add in the tomato puree. Mix well with a ladle or cooking spoon and then put in the coriander seed powder and the red chilli powder. Cook until the spices get incorporated into the tomatoes and the oil separated from the tomatoes. Take a ladle full of the drained beans (about 1/2 a cup) and add it into the tomatoes. With the back of a spoon mash the beans well. Put in the remaining beans into the pot and stir well. Add the reserved water, salt and the coriander leaves, raise the heat to medium and bring to a boil. Lower the heat a little and cook stirring in between until the gravy thickens to the desired consistency, about 15 minutes. 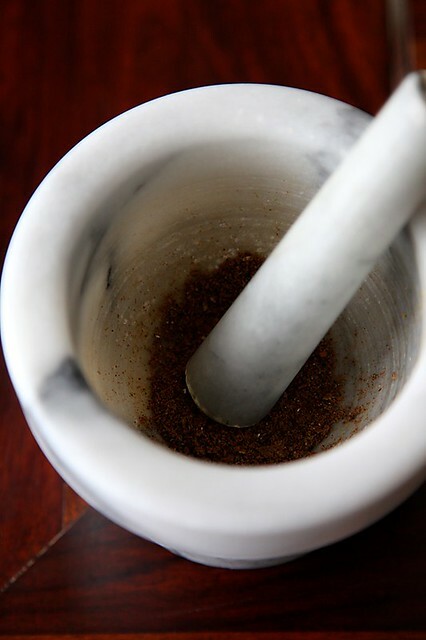 Assemble all the spices in a mortar and pestle and pound into a powder. Alternatively use a coffee mill or dry spice grinder. Put in the garam masala, stir and serve hot with rice or rotis. Wash the rice in 2 to 3 changes of water over a colander in a running stream of water. Place the rice grains in a bowl, cover with water and soak for half an hour. In a small bowl place the saffron with the warmed milk or water. Allow to soak for ten minutes or more. Drain the rice over a colander and remove all the water. Place the saffron and the milk in a mortar and pestle and crush to extract the flavour and beautiful hue of saffron. In a pot with a tight fitting lid, heat the ghee or vegetable oil over a medium flame. Add the cumin seeds, cinnamon and cloves, lower the flame and when the cumin turns golden brown put in the rice. Stir fry for 2 to 3 minutes. Pour the water, saffron mixture and turmeric, raise the heat and bring to a boil. Lower the heat and cook covered for about 15 to 20 minutes or until done. 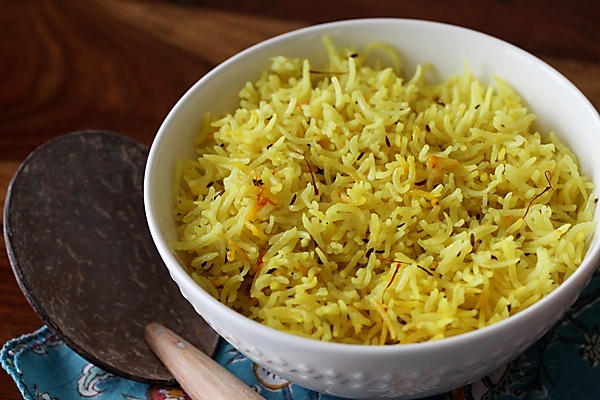 Alternatively, cook in an electric rice cooker by transferring the contents from the pot after adding the water, saffron and turmeric into the electric rice cooker. It's funny how growing up I couldn't stand the sight of kidney beans, and would try my best to only eat the gravy whenever my mom made rajma. This winter however, I actually ventured into the kitchen for a late night snack when my mom was visiting, and decided to have a bowl of rajma chawal to get some comfort from the cold. Needless to say, I was hooked and harrased her cook it every week until she left! Your recipe and pics look simply delish, and makes want to try my moms recipe for dinner tonight! Beautiful site BTW, and a mouth watering array of recipes for me to try! That's interesting to know abt kashmiri cuisine …am so trying this rajma …just wish we get gud variety of it here !! Razma chawal is perfect combo. Your is mouthwatering. Will make this yummy rajma sooon! Yummy curry…and saffron rice looks so flavourful. New look is cool!! Rajma chawal is such a comfort food for me and yours look perfect and so delicious.. Even though I am a true blue Southie, rajma/chawal is my all time favorite comfort food. Must be all those years I lived in Lucknow. Its our Friday menu here at home, but this recipe is a new take on it. Looking forward to trying it out next week with the saffron rice! Pics look amazing! Wow what an awesome combo… wish I could immediately dig into it… gorgeous pictures…love love love it. We rarely make Rajma or Chola at home so I never got to know the recipe for it. Personally I prefer to avoid garlic and onion so this recipe, with its simplicity, was perfect. Made it yesterday and it turned it pretty good. Am glad to have added this to my repertoire. Thank you so much. Thank you everybody for all the valuable inputs and feedback. A lot of work has been put up to bring to you this version of divinetaste and I'm glad you all like it. DK: I'm a rice person too! Can't live without my daily dose of rice! Meena: A mother's cooking will always be the most comforting…isnt it? Thanks for chiming in! Suma & Asmita: I hope you will enjoy this version without onion and garlic. Pan cuisine: I have been totally caught up with this revamp and my baby starting playschool. Will be back soon with great recipes! Thanks for your feedback and interest! Pooja: Will mail you shorty! I am really delighted to see a no onion no garlic rajma recipe. i always believed that onion and garlic are not the only things which flavour to the food. the picture of rajma you made declares it. thanks a lot. Rajma is a staple in our house, but for me it gets boring to make it the same way always. Let me try this variation & relish the difference. And yes I've to still absorb the new look. I notice you link to a specific saffron merchant in your recipe – do you particularly recommend them? I've been wanting to try cooking with saffron, but there's such a wide range of prices and quality out there (which are probably related…) that I don't really know how to tell what's likely to be good saffron from bad. Paige: The link that I have given is the best saffron that I have tested. Price need not necessarily be an indicator. Go by the colour, smell and length of the saffron strands. Rishabh: That's wonderful! All the very best in your future cooking ventures. Hope to hear from you about other dishes you try too. This looks lovely!!! For those of you who appreciate the absence of onion and garlic, I want to share something I've just learned from my spice guru. Asafetida (aka Hing) is an excellent replacement for garlic and onion. Many recipes call for a pinch, mainly for flatulence and digestion, but it's a GREAT flavor booster for those who have allergies within the onion family. It has quite a strong flavor which emulates those ingredients. 1/2 tsp is the largest amount I have seen in a recipe. Thank you for this post, I will be trying this week! Anu loved your rajma recipe.the no onion garlic is specially appealing and makes it so satvik.thanks a ton for this revelation! my mom is making it for dinner!!!!!!!!!!!!!!!!!!!!!!!!!!!! i think its going to be AWESOME !!!!!!!!!!!!!!!!!!!!!!!!!!!!!!!!!!!!!!!!!!!!!!!!!!!!!!!!!!!!!!!!!!!!!!! pranav: 🙂 Hope you liked it! just curious..you don't eat onions due to religious/spiritual reasons? it's good you have an entire website dedicated to satvik recipes. I am a vegetarian but I still consume onions and garlics. Recent readings/research have made me rethink consumption of onions and garlic. But since i have been eating it all my life, it's a little difficult. You have a wonderful website and I always love reading about food before i make and eat it. good way with words, amazing photographs and so much of dedication,keep it going! much love, don. Wonderful recipe! I made it today. Its truly divine and the best Rajma recipe I have tried so far. I'll try using red beans next time. Thank you! Pravin: I have a lot of respect for men who cook. Keep going. All the best!